Knowing how and why a fault has occurred in mainly mechanical components in service as well as during their manufacturing phase is the first step in establishing the bases for an effective, long-lasting solution. Thanks to our experience and knowledge in lubrication, maintenance, tribology, mechanics or mechanical component design, among other things, IK4-TEKNIKER is turning its expertise into specific solutions and with the maximum guarantee for detecting the causes of faults in industrial components in different sectors. What is more, we offer an Advisory Service on Solutions by proposing alternatives to minimize the consequences of recurring faults in production processes, in which reliability is a key aspect. 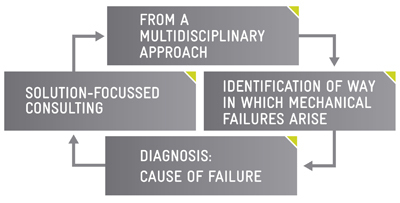 Diagnosing the Causes of Faults is set in motion as soon as a problem has been spotted in any component, either during its service life or during its manufacture. However, the service is not restricted to providing one-off solutions for the mechanical or working problems of machines. So that our clients can obtain the maximum value potential, IK4-TEKNIKER has designed a permanent consulting service for companies. That way, clients can acquire up-to-date information about their industrial processes and minimize the costs caused by the problems that arise. After that, following a multidisciplinary analysis process involving high added value, the experts issue their diagnosis, which is then turned into the basis for finding the best solution for the problem in the component or industrial process. To issue their diagnoses, the IK4-TEKNIKER researchers conduct metallurgical, mechanical, chemical, friction, wear and corrosion tests. Measurement of residual stresses by means of x-ray diffractometer (stress depth profiling and measurements in real parts). Measurement of residual stresses (depth profiling) through the hole drilling technique. Measurement of residual stresses by means of neutron diffraction to obtain stresses inside actual large-sized parts. ASTM B117 Salt spray chamber (2,030 x 635 mm). Titanium Autoclave for constant load/cyclical fatigue of 25kN in corrosive liquid, up to 300⁰C and 16MP. Autoclave for constant load/cyclical fatigue of 25kN with ceramic furnace to work with gases (CO, CO2, SO2,…) up to 800⁰C.